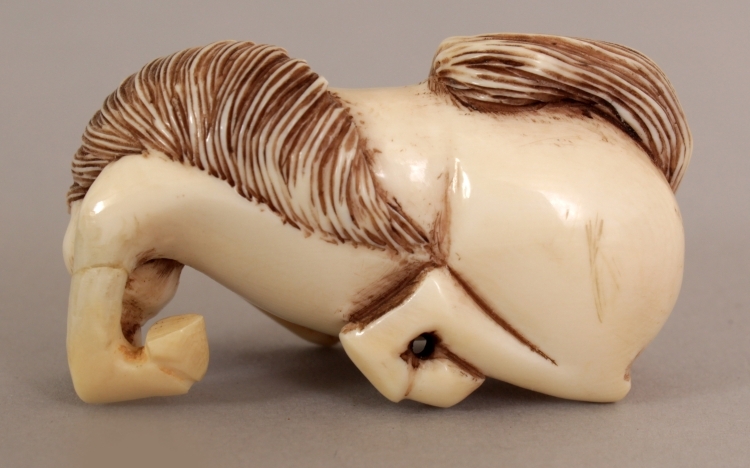 Netsuke carved ivory horse in a kneeling position. It has a turned head to graze. Furthermore, the base has an engraved signature. The Netsuke is approx. 4.32 cm long and 2.79 cm high. In addition the horse weighs 22 grams. We have many more Netsuke for sale which might not be online yet. If you are looking for something special don’t hesitate to contact us. You can do this via for instance our contact form. Or we can even help you find a special piece for you. The same goes for snuff bottles and other items which might interest you or which you collect.